Spray the inside of a slow cooker with cooking spray. Line the inside with foil, then spray the foil. In a large bowl, beat together cake mix, water, oil, eggs, butter and 1/3 can of sweetened condensed milk on low speed 30 seconds, then on medium speed for 2 minutes, scraping bowl occasionally. 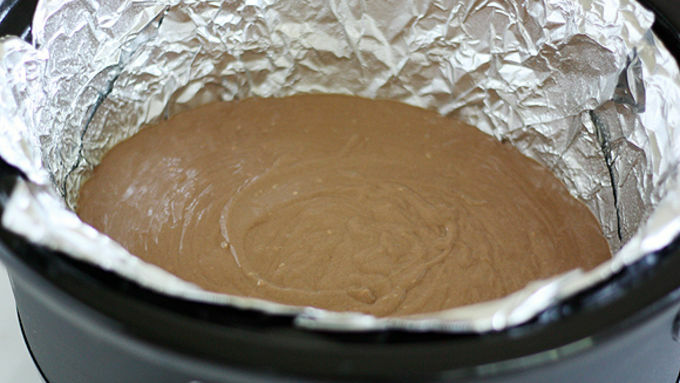 Pour half of the cake batter into the bottom of prepared slow cooker. Cover and turn on HIGH. Bake 1 1/2 hours or until cake is just set. In a medium bowl, combine caramel bits and another 1/3 can of sweetened condensed milk. (Reserve remaining 1/3 of the can for another use.) Microwave for 2 to 3 minutes, then stir to melt caramel bits. 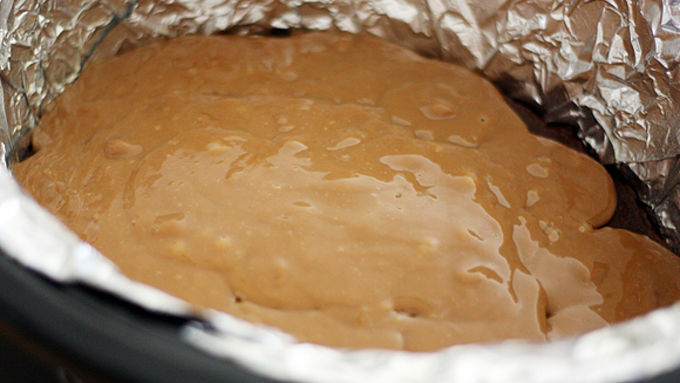 Pour about 2/3 of the caramel mixture on top of the cake in the slow cooker, then pour remaining cake batter on top. Cover and cook on HIGH another 1 to 1 1/2 hours, or until a toothpick inserted in the top cake comes out mostly clean. Remove stoneware insert and transfer to a cooling rack; cool cake 15 minutes in insert. 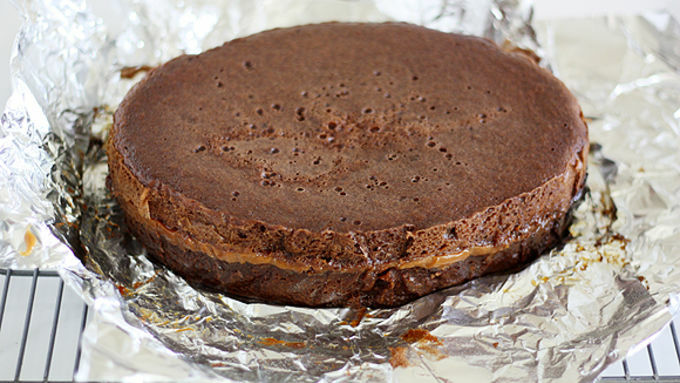 Carefully lift cake from the insert using foil as handles and place on cooling rack. Carefully remove foil from sides of cake. Place a serving plate upside-down on top of cake. Carefully and quickly invert cake onto serving plate. Cool completely. 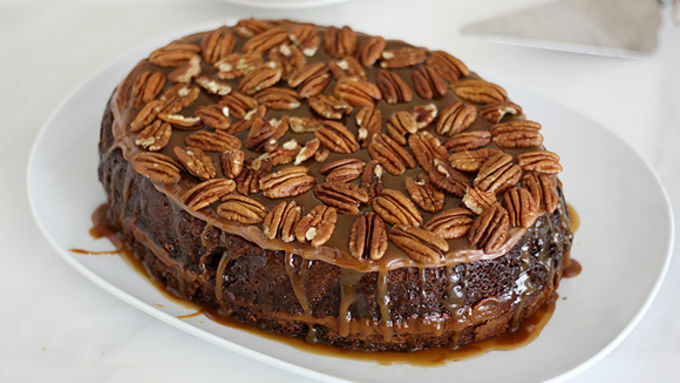 Frost the top of fully cooled cake, then drizzle caramel sauce on top. Sprinkle top with pecans. It’s summer, and it’s time to meet your new BFF: the slow cooker! Why is the slow cooker your new best friend? Because not only does it keep you from sweating in the kitchen when it’s toasty outside, but it also makes magical things happen. Things like this Slow Cooker Turtle Upside-Down Cake. Uh huh. You read that right. So again, I say: The slow cooker is your new BFF. You two will be very happy making this cake together. Let’s get baking – er, slow cookin’! 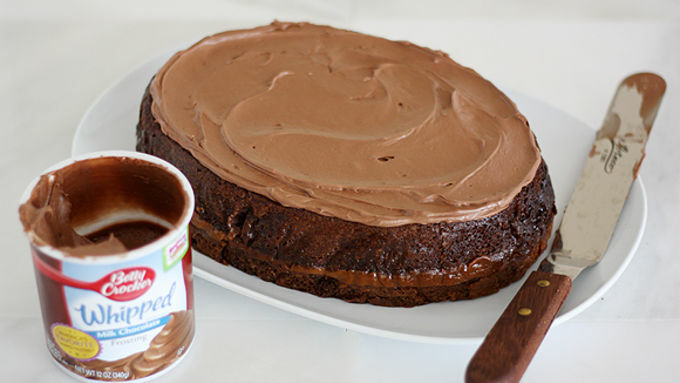 This easy peasy and oh-so-tasty cake is absolutely worth making. From here on out, you’re about T-minus three hours to slow cooker cake bliss – with almost no effort at all. Grab a friend and devour this treat – a piece at a time ‘til it’s gone. At least that’s what I did. All in!